At this time of year, the hedgerows and countryside are lush and green, and I’ve spent much time admiring the grasses that line my regular walking paths. These plants are often overlooked, but they provide the background canvas onto which all other plants paint their colours. They give the depth to the vegetation because they occur in such vast numbers, but when looked at closely they have a wide variety of forms, from sturdy to delicate, and their seed heads are likewise varied. 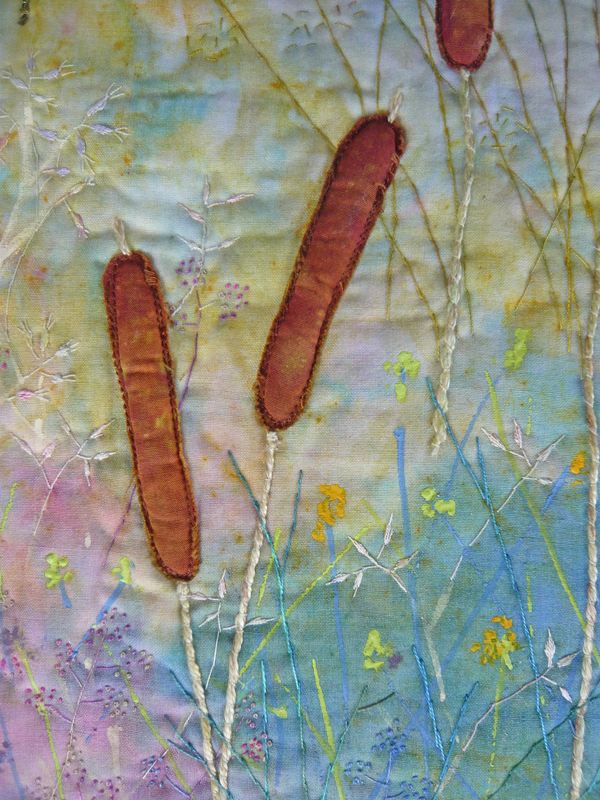 In this piece I have used sedges and rushes alongside the grass heads, because these also fall into the same sort of plant families, and they are also familiar plants at this time of year. In this piece they provide the simple lines of the architectural structure of the design, alongside the complex patterns of the interlocking grasses. The plants I have used are winter wild oat, quaking grass, greater woodrush, pendulous sedge and reedmace. 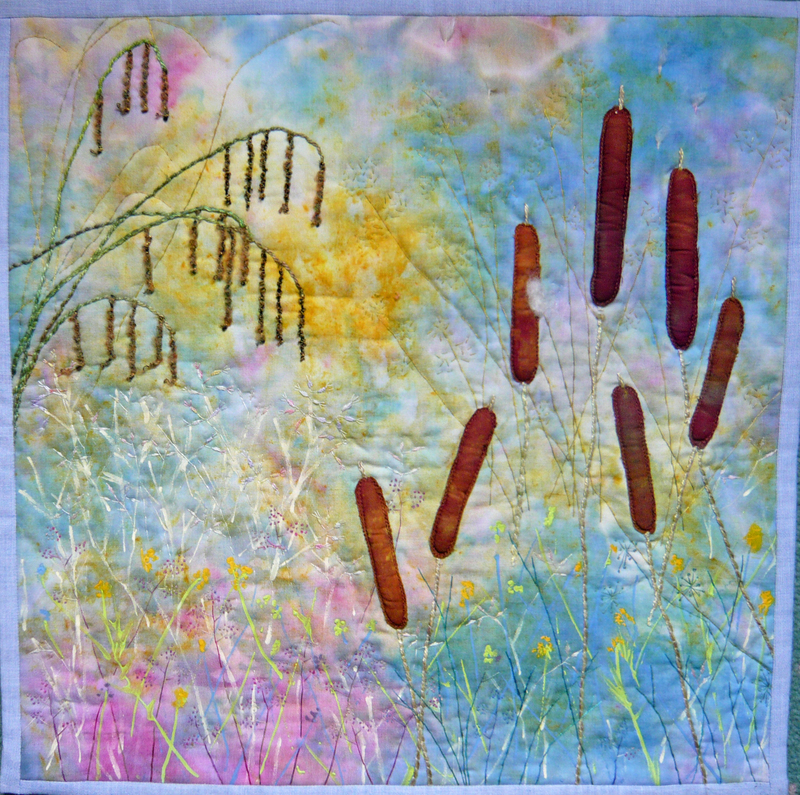 I used microwave dyed polycotton for the background in colours that remind me of summer, and I added further background details with acrylic and texture paints. 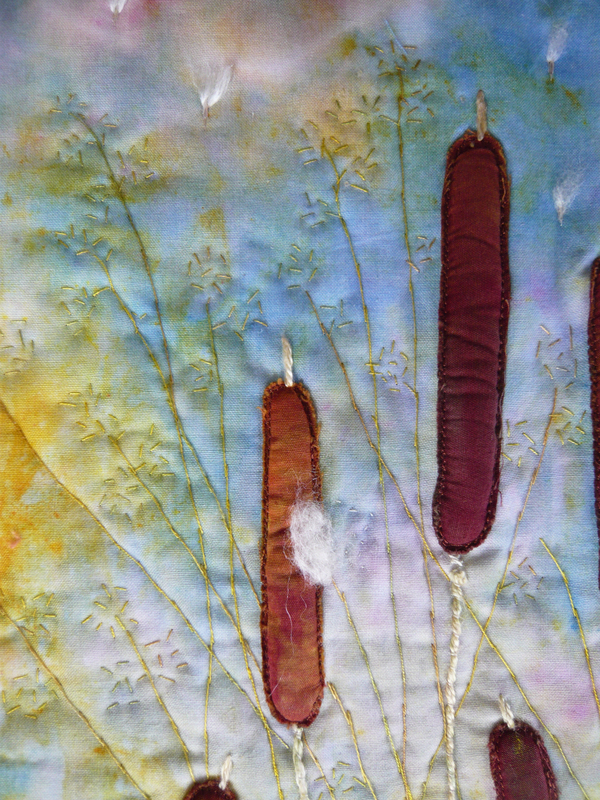 I added the reedmace heads with trapunto quilting to create its distinctive shape. The seeds of reedmace (also known as bull-rush) are fluffy and were once used to stuff pillows and mattresses, so I wanted to include a reference to this, to emphasise that the form we see is the seed-head. I have used wool fleece fibres to show the seeds bursting from the seedhead, and floating above the plants. I couched down the threads which formed the hanging seed-heads of the sedge. 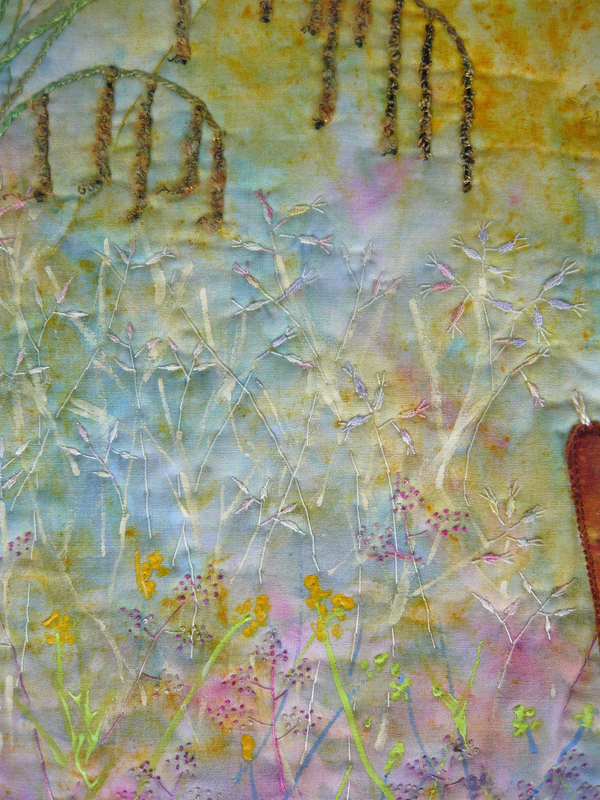 The grasses and the background details were ‘drawn’ by stitching with various thread. All stitching in this piece has been worked by hand. Finally I added a stalk of sweet cicely (which is included in all my pieces for this series) – you challenge is to find it in this piece! Joan I am enjoying your series and this quilt is delightful (especially the use of trapunto), the background is light and airy. Well done. Very delicate with so much fine detail. I made the mistake of bringing some bull-rushes back to France a few years ago, they were great until they burst!! You have captured the seeds beautifully. This is a really lovely series, great work! Another delicate piece Joan ! and it goes beautifully with the atmosphere of your series. I like the airy feeling in your pieces. This really is summer to me. I love this quilt and like the trapunto for the reedmace heads. The hanging seed heads from the side are very effective for your design. So much detail and so delicate. The pastel colours fits again so nicely in the rest of your series. Love it. Lovely! This really feels like summer and reminds me of holidays on the canals. And I found the sweet cicely. Joan, what a lovely pieces in you series! The way you put the seeds in the reedmace is just great and the colours surely look like summer. I also love the grasses, with their different colours and movement and you description is like a poem. Joan another truly beautiful quilt full of detail and a variety of techniques. Your quills in this series have such delicate layers and fine detail in the background that upper layers seem to float. You have created so many lovely and delicate details in this quilt with all the techniques and hand stitching. Well done!